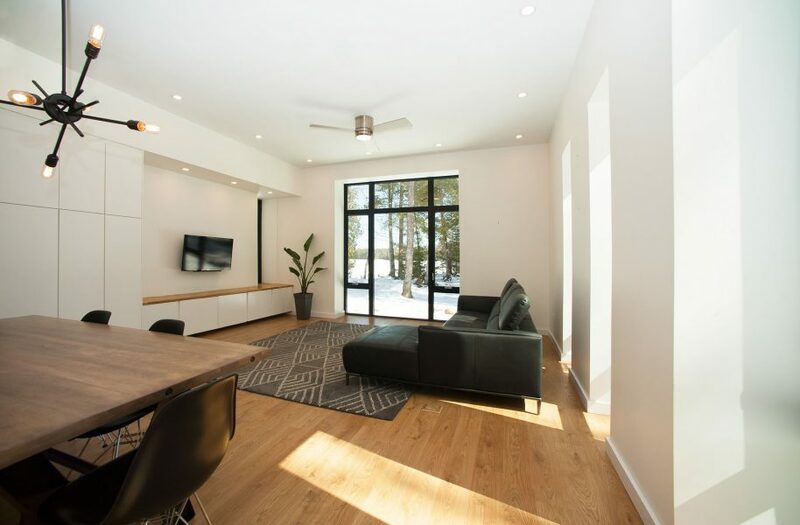 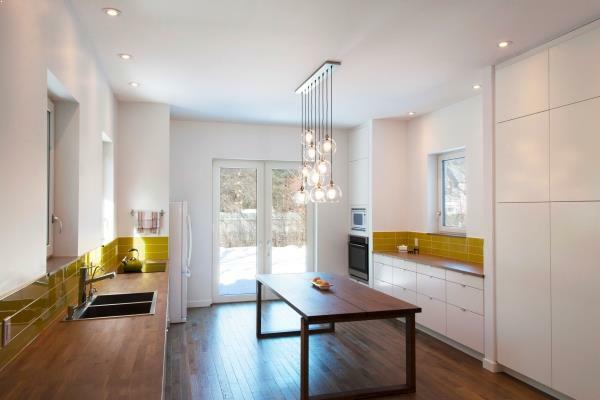 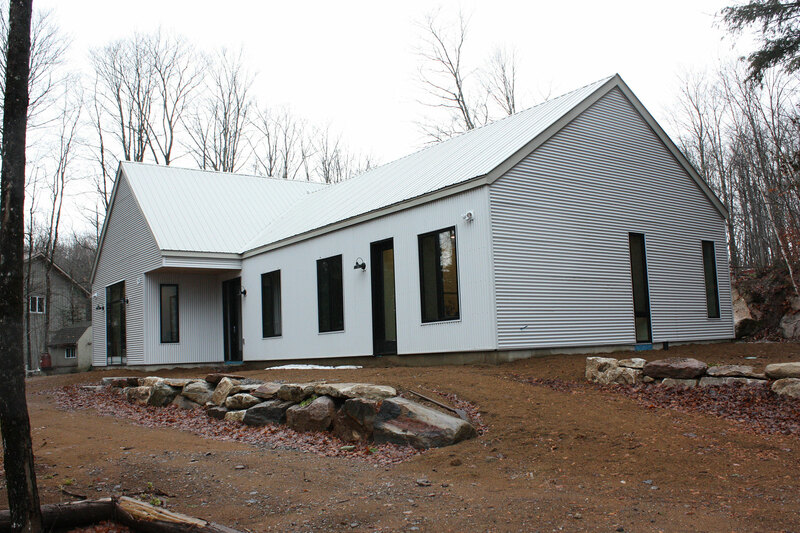 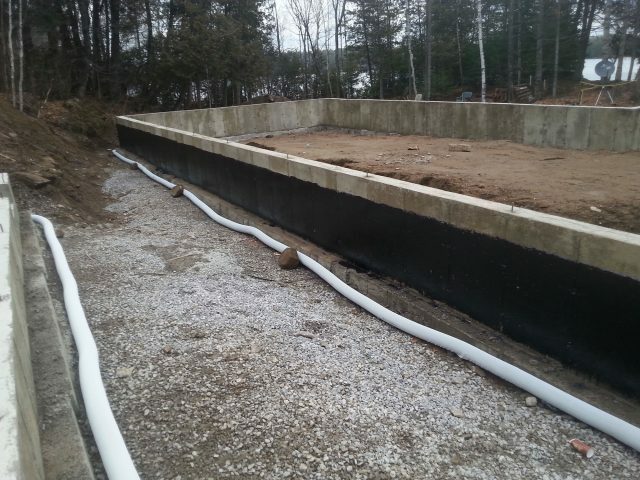 This rural new build, located near Kawartha Highlands Provincial Park just north of Peterborough, was built under odd and unfortunate circumstances. 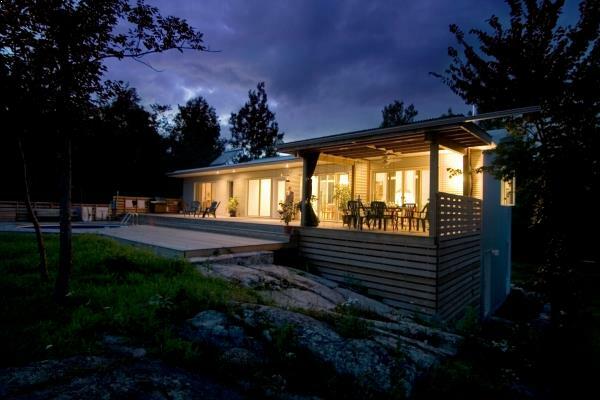 The clients’ old home on the same property was hit by lightning and burnt down. Thankfully no one was hurt, but the home was completely destroyed. 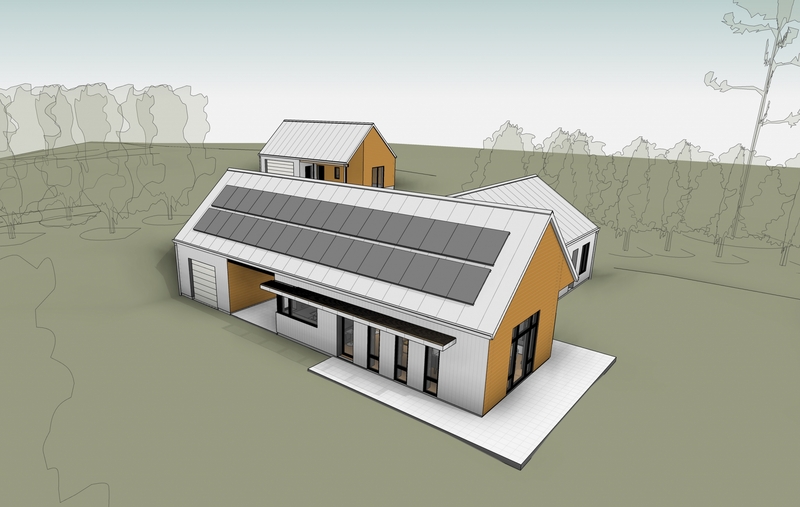 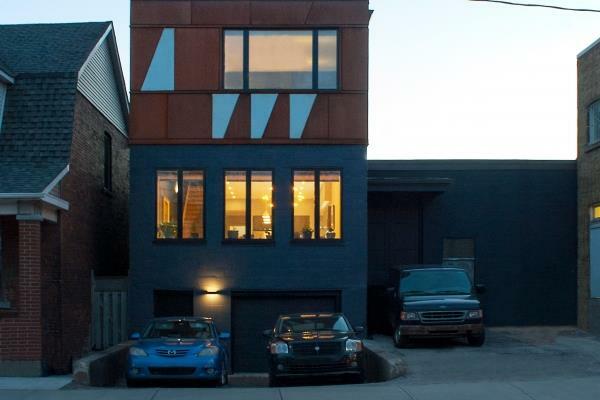 However, this unlikely circumstance led to an amazing opportunity: Building an entirely custom, Net Zero energy house. 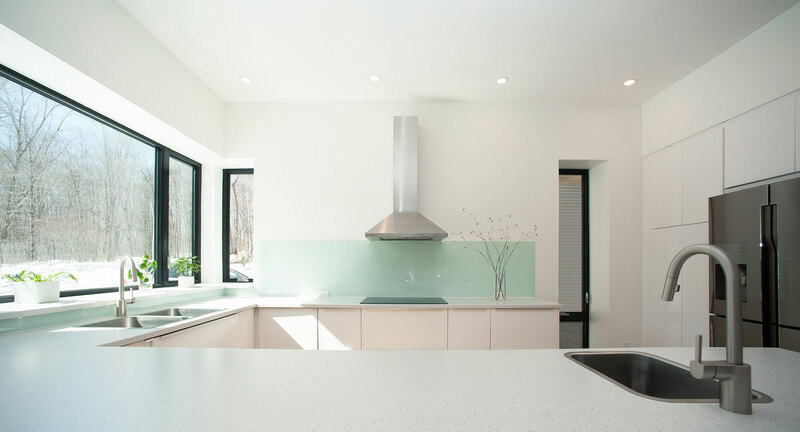 The home’s main priority is its Net Zero energy goal. 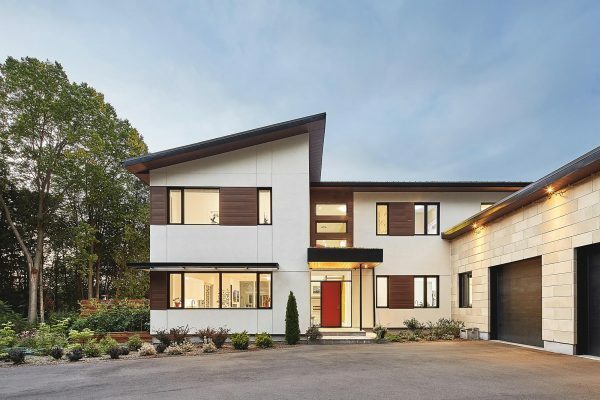 Everything from the home’s location and floor plan to the building materials and energy collection sources used are dictated by the impressive goal of using as much (or less) energy than the home creates. 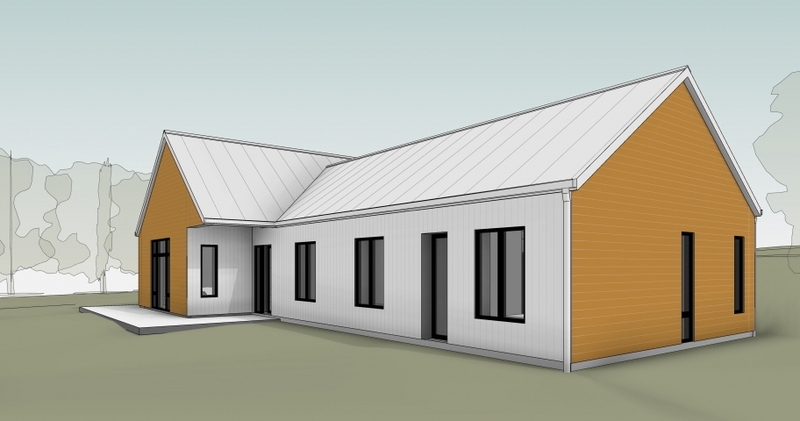 The home is laid out in a rough “T” shape, with the southeast facing great room, a paved breezeway, and the northeast detached garage making up the top branch. 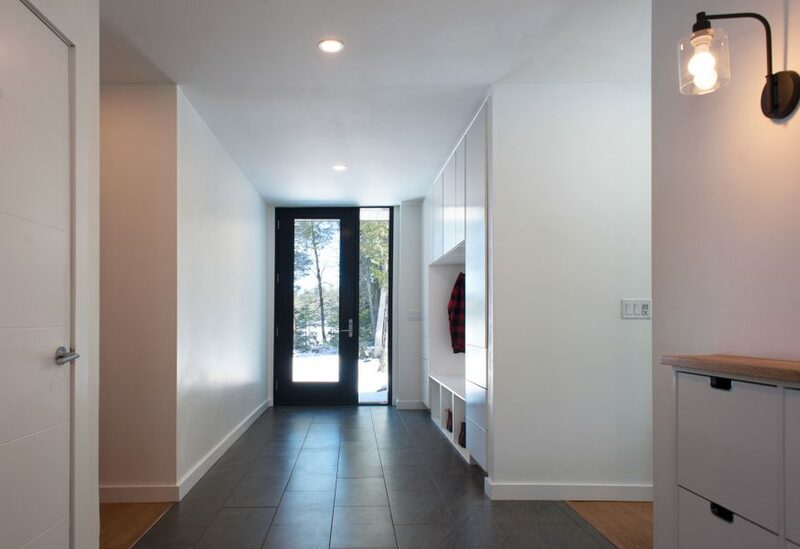 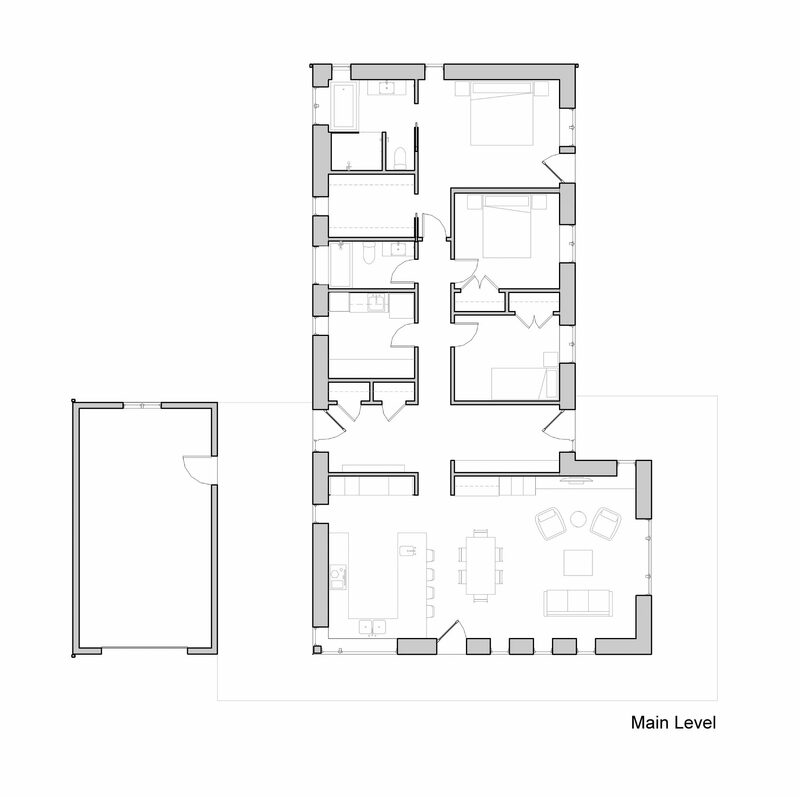 An interior foyer marks the intersection of both branches, and the lower branch of the “T” contains the home’s bedrooms, facing east, and two bathrooms and laundry and mechanical rooms, facing west. 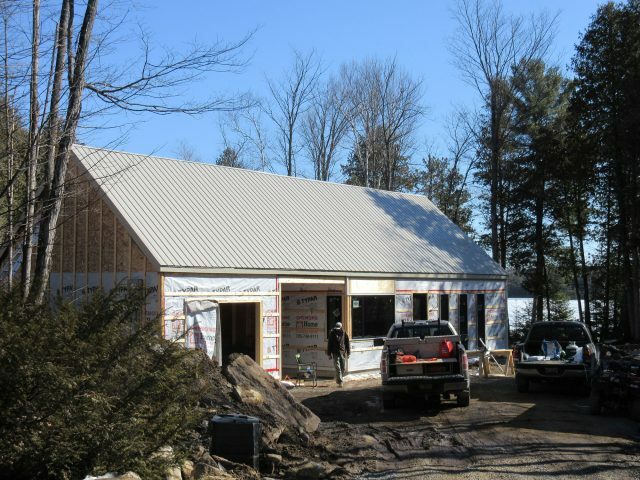 The home’s construction is unique, as its structure is composed of a double-wall assembly. 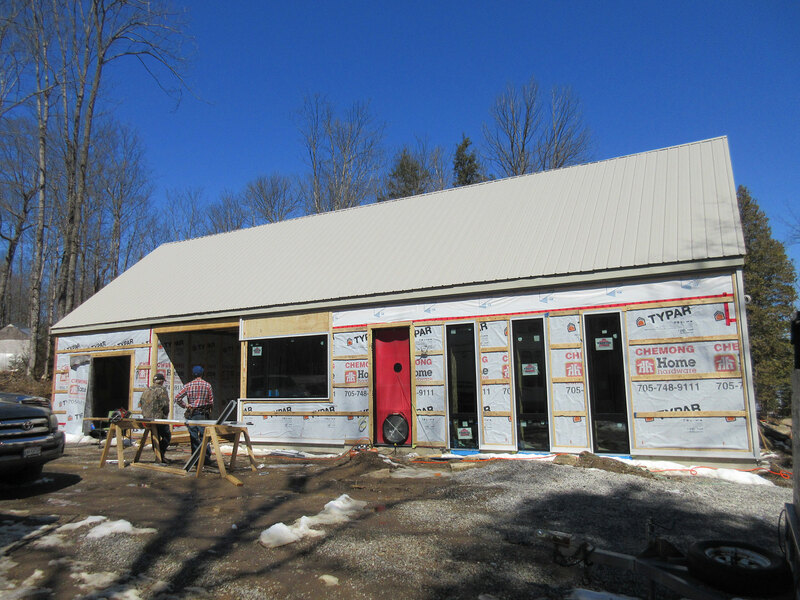 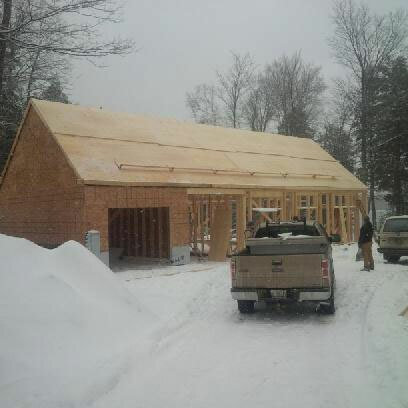 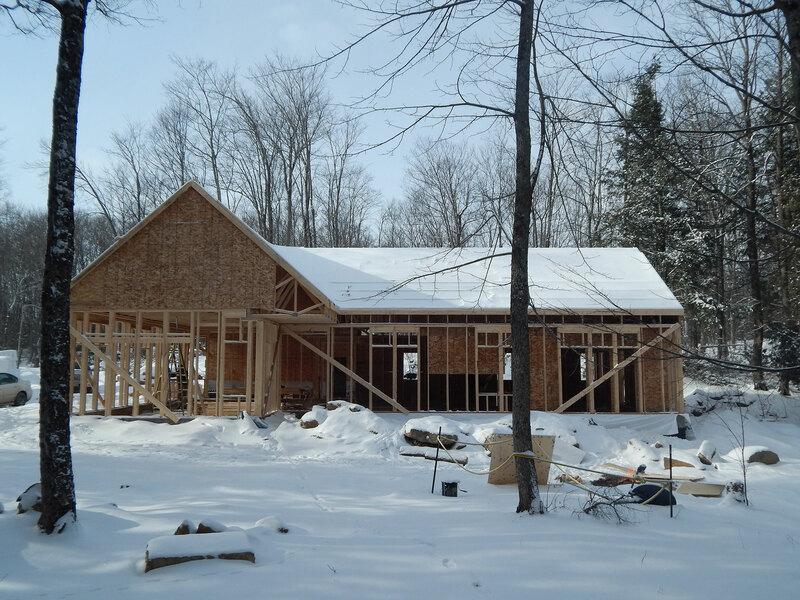 The outermost, load-bearing frame is constructed with 2×6 wood framed wall studs, which hold up the engineered truss roof and extensive amounts of roof insulation. 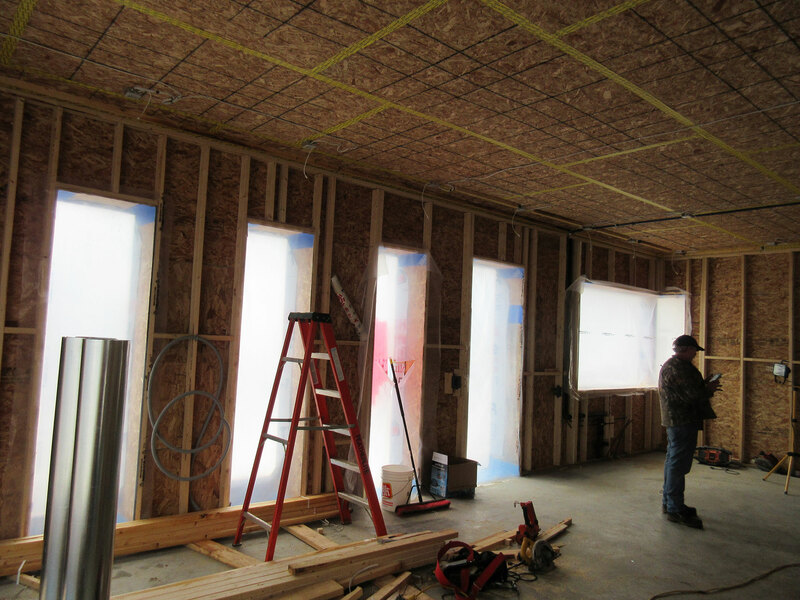 Set 7.5 inches in from the 2×6 stud walls is an additional structure of 2×4 wood stud walls, onto which the interior air barrier and plywood sheathing is applied. 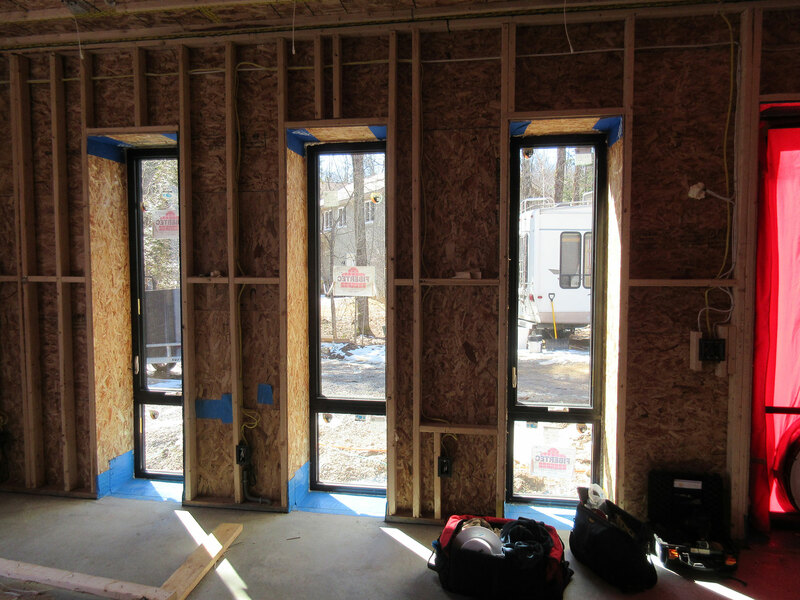 The 7.5 inches of space between stud walls is filled with insulation, giving the walls an insulation value of R60. 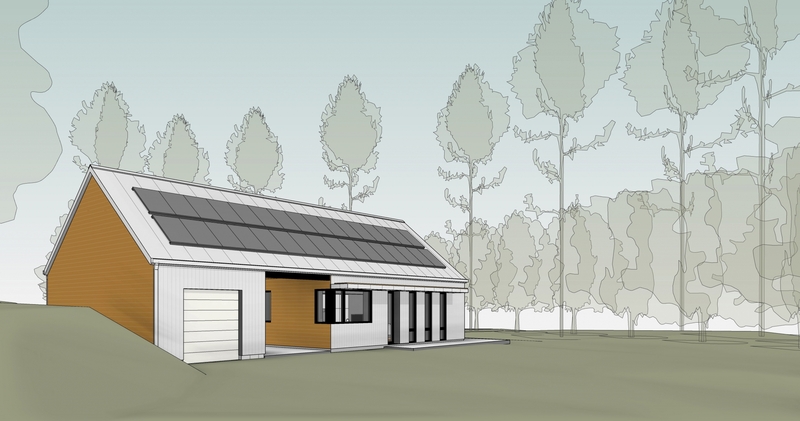 The property is filled with PV solar panels, on the south-sloped roof and the detached garage and workshop. 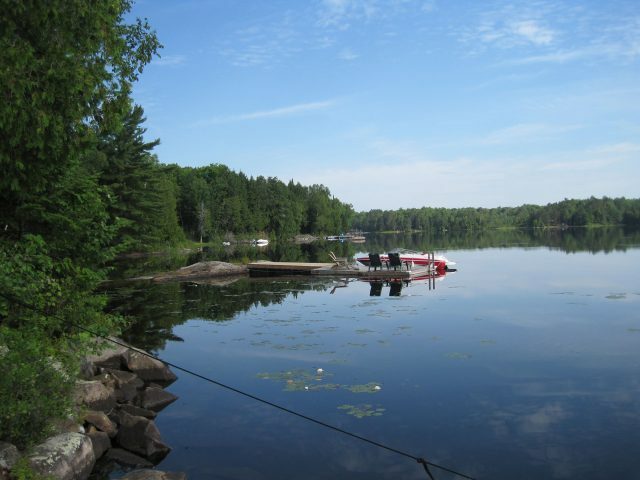 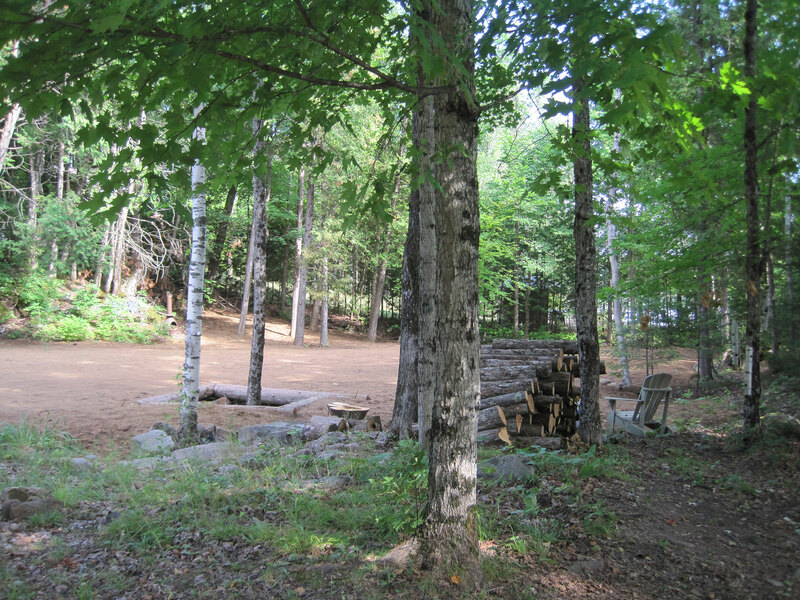 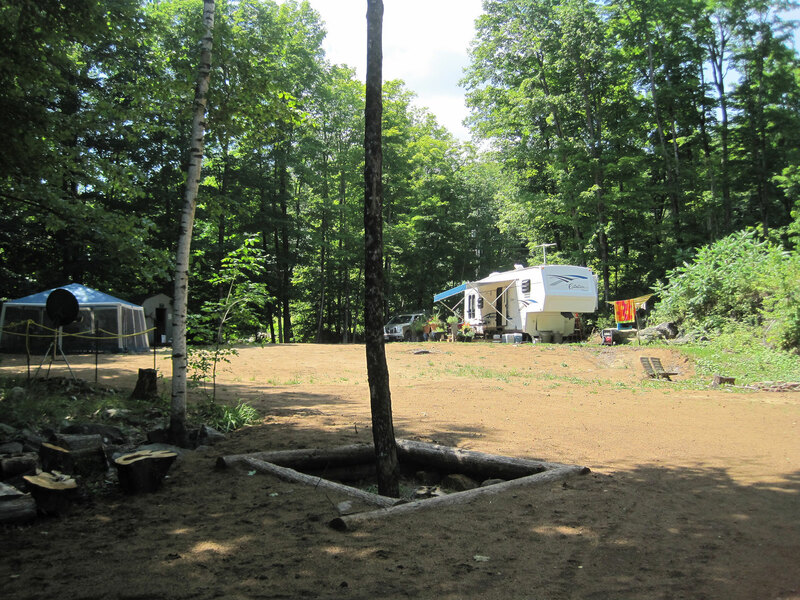 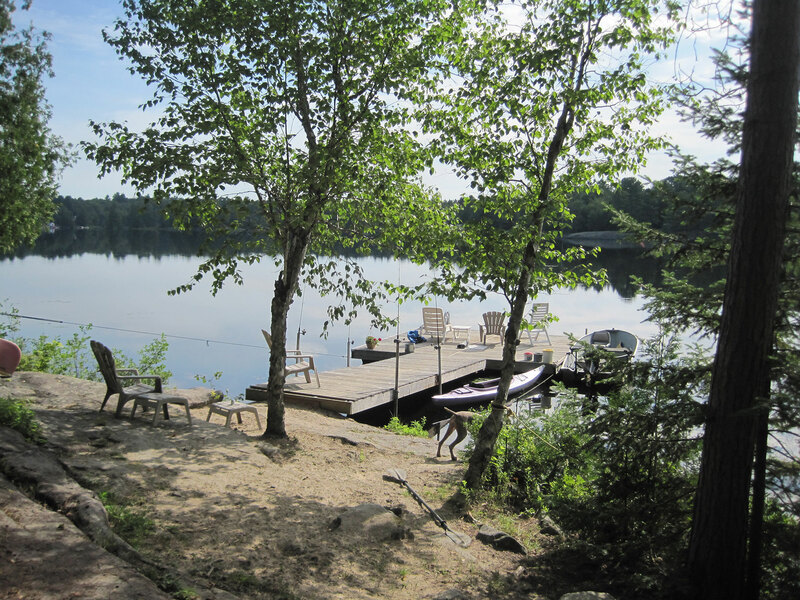 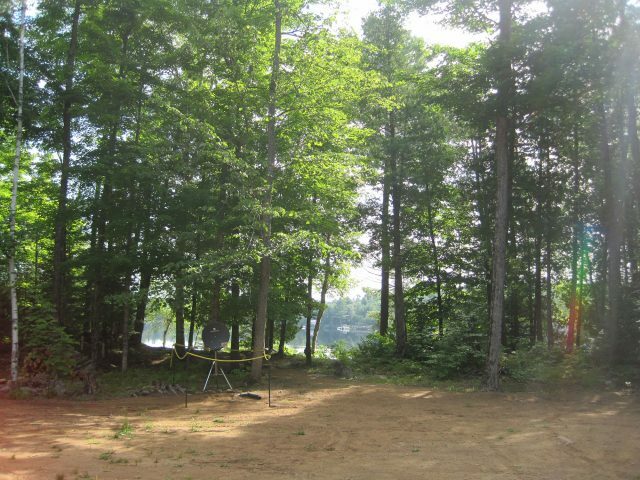 The property is a 1-acre plot with an east-facing lakefront and dense cedar forests to the north. A large limestone rock outcropping near the property’s connecting road, cuts the property in half, standing about 6-8 feet high. 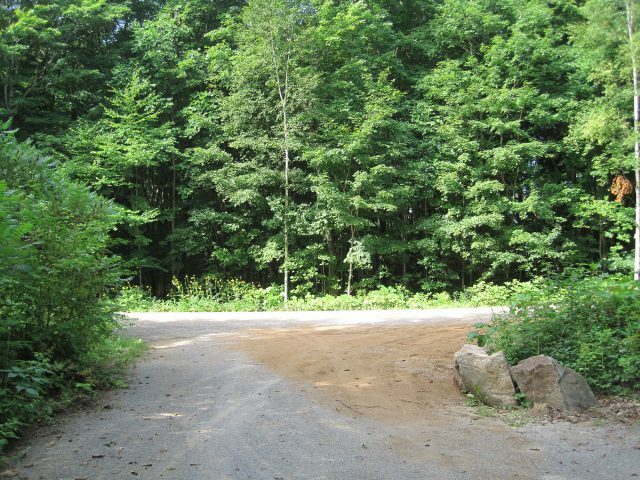 Half the property sits at road-height, and the other half slopes downward to meet the lake in the east. The home’s layout utilizes tried and true passive solar principles to minimize energy use and maximize passive energy collection, with long south-facing windows and a pitched roof perfect for solar panels. 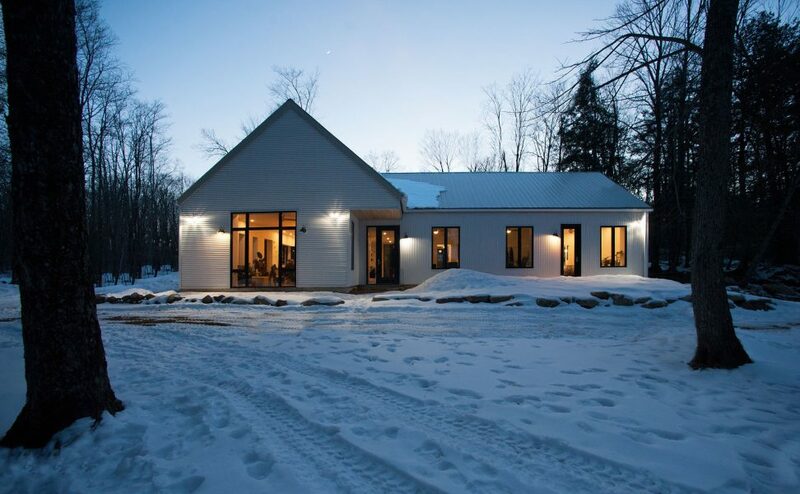 However, due to the landscape’s eastern lakefront, the property’s picturesque views from the east were also taken into account in this home’s floor plan. 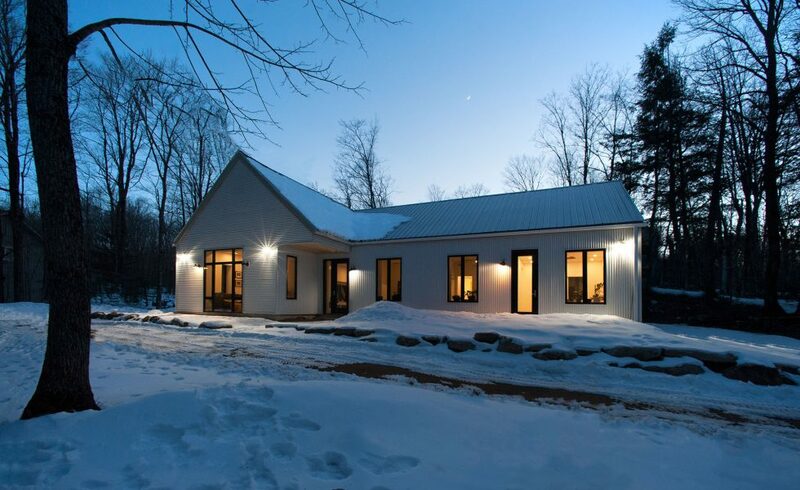 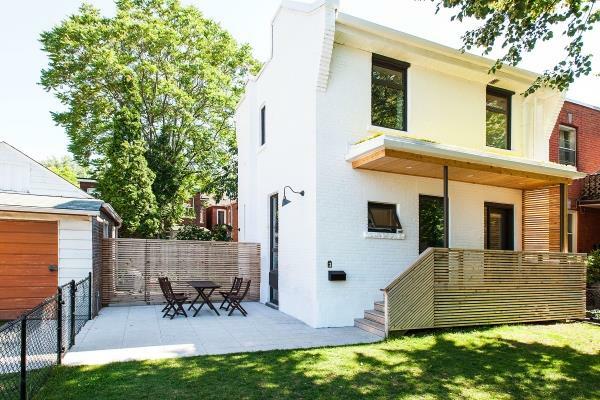 The home sits at one storey tall, with two intersecting roofs – the first running north-south, covering one branch of the house, and the second running along the east axis, covering the length of the garage and the great room in the second branch of the building. Under this east-west roof also sits a paved breezeway connecting the garage in the northeast end of the home and the southeast Great Room. 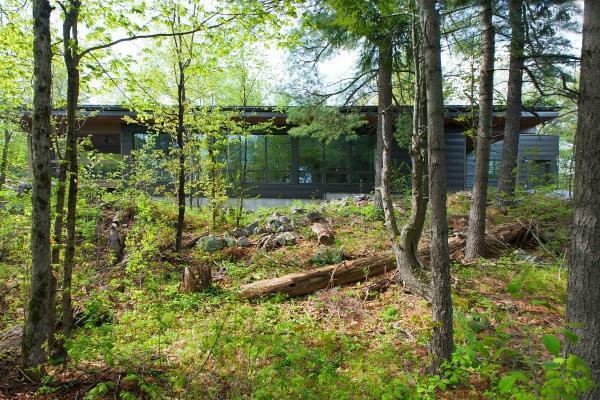 The Great Room has tall southern windows for passive solar gain and beautiful views of the lake to the east. 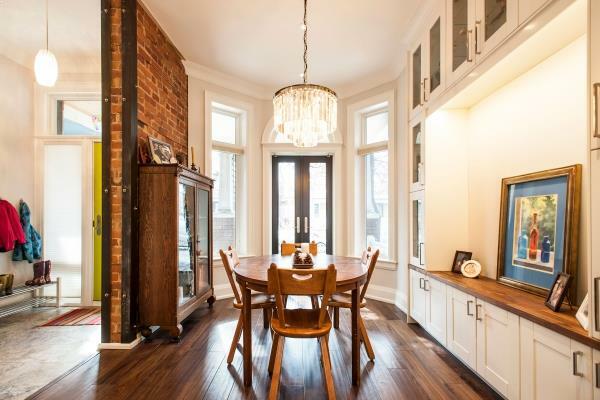 The more private areas of the home are located in the branch of the home running north-south. 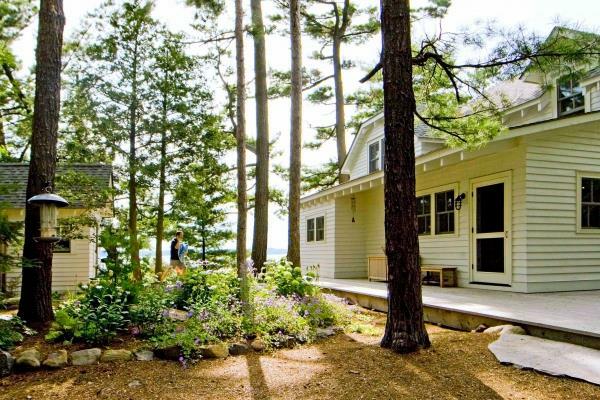 Three bedrooms run the length of the home, with eastern windows to catch the lake. 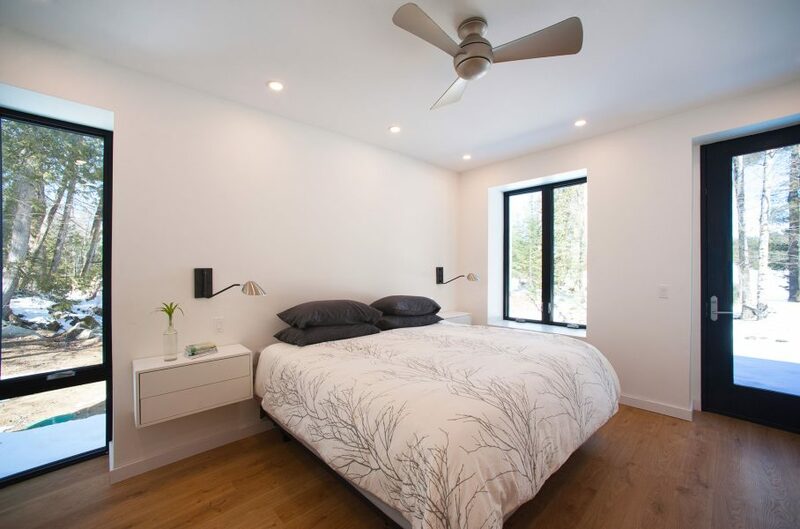 The Master bedroom stands at the north end of the home, with a master bathroom facing west, and a private exterior door that opens to the east. 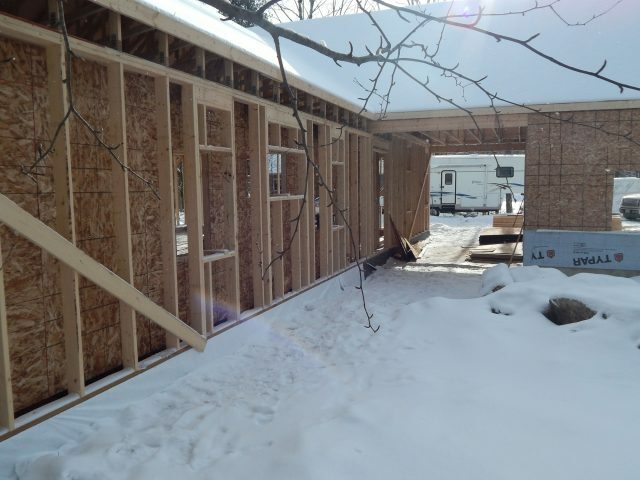 Across from the two guest bedrooms are a guest bathroom and a laundry and mechanical room, both facing west. 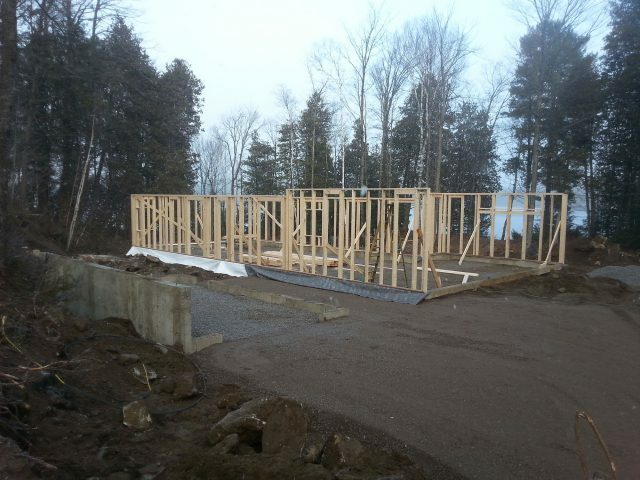 The home is constructed with a double-stud wall assembly. 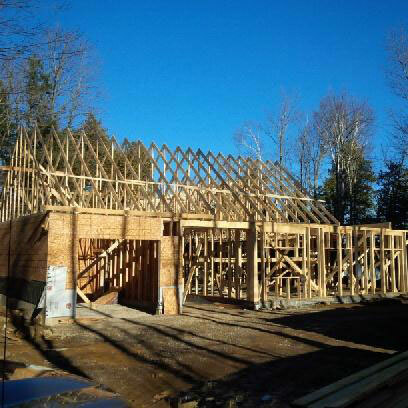 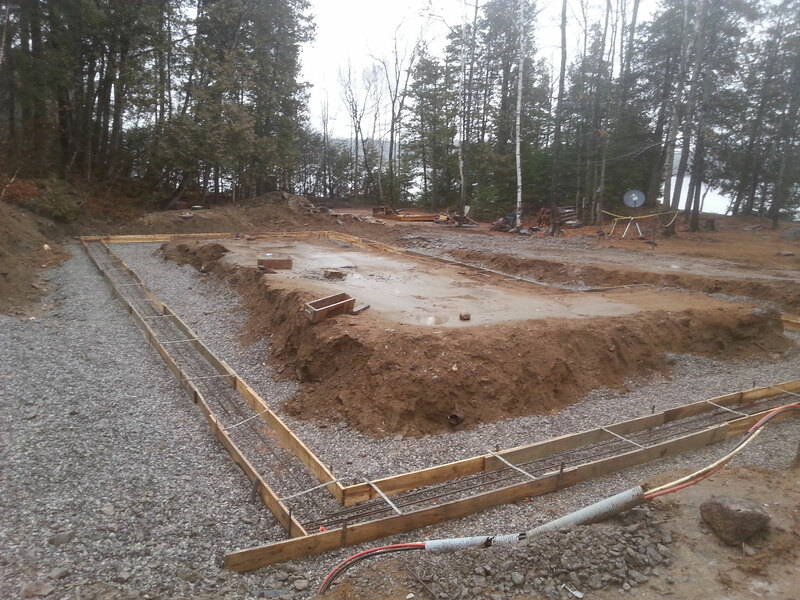 The first, outermost structure is conventional 2×6 wood stick-framing, conventional concrete footings and foundation walls. 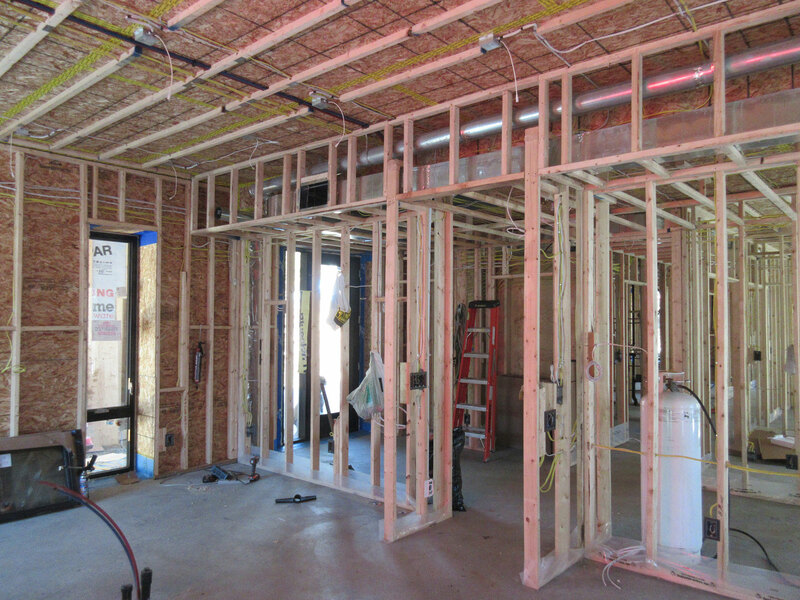 7.5 inches of space set the outermost wall assembly from the inner, 2×4-stud framing. The 7.5 inches of space between the stud walls, as well as the 5.5 inches of space between the 2×6 studs, was filled with dense pack cellulose insulation, giving the walls an impressive insulation value of R60. 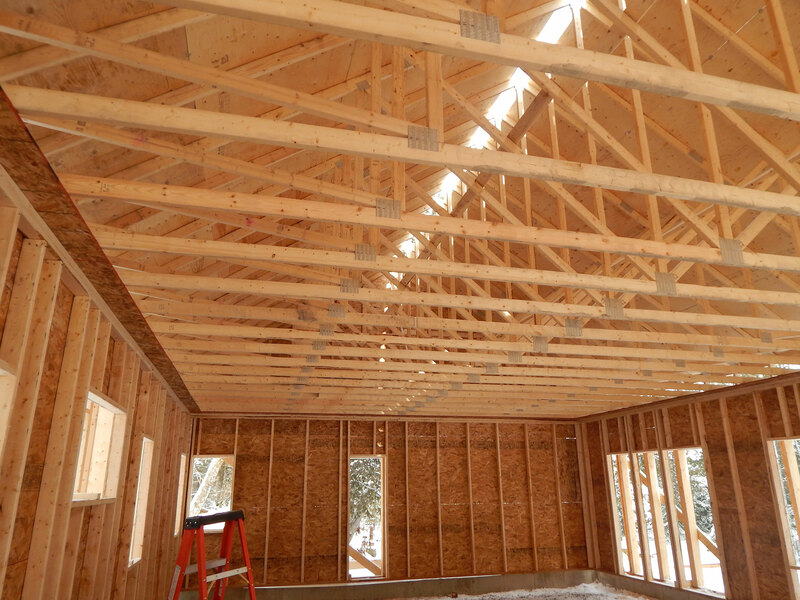 The engineered truss roof, supported by the 2×6 load-bearing stud walls, was similarly filled with extensive amounts of blown-in insulation. 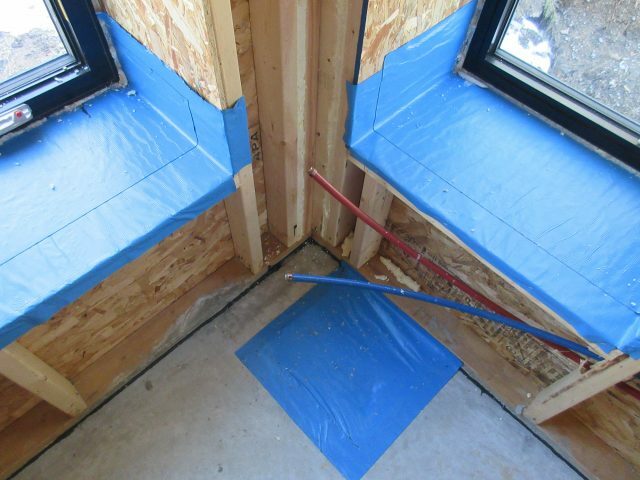 The house’s air barrier is a combination of the peel-and-stick BlueSkin VP100, between the insulation and the inner 2×4 walls. 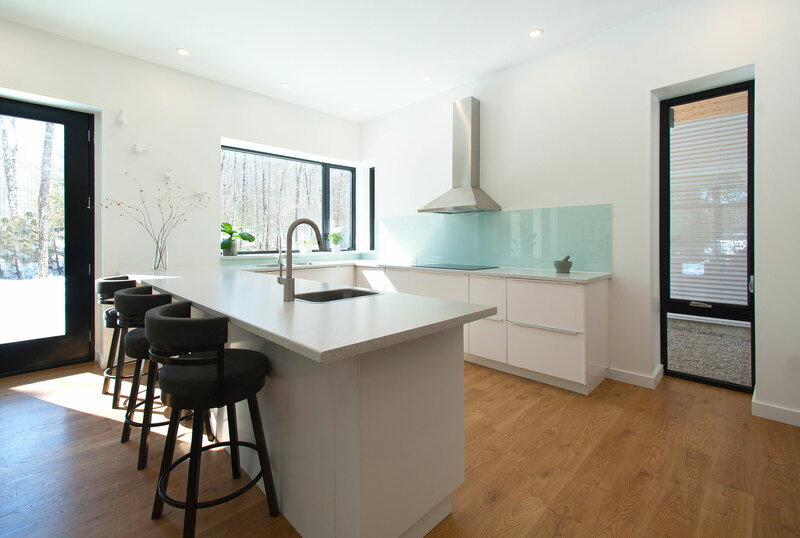 The heating and cooling system is an efficient air source heat pump by Mitsubishi, which is ducted to distribute hot and cool air evenly throughout the whole house. In separate ductwork, the Heat Recovery Ventilator, ventilates the home, while retaining moisture levels from outgoing air. 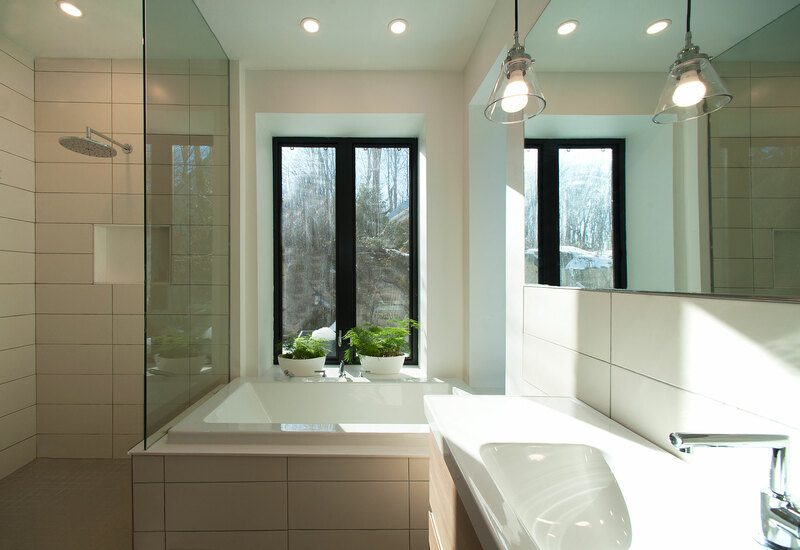 Domestic water is heated with a standard electric tank. 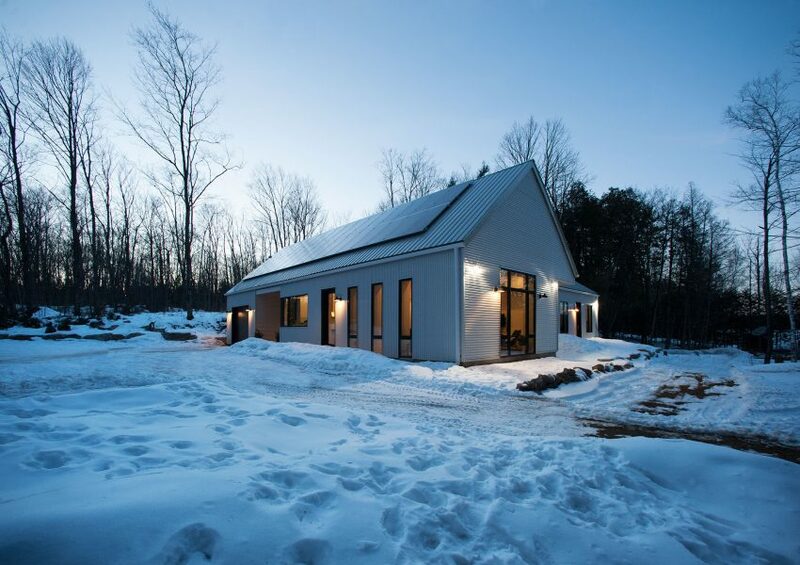 The southern slope of the home’s long east-west roof was topped with 40 PV solar panels, and an additional 20 panels were installed on the detached garage and workshop. 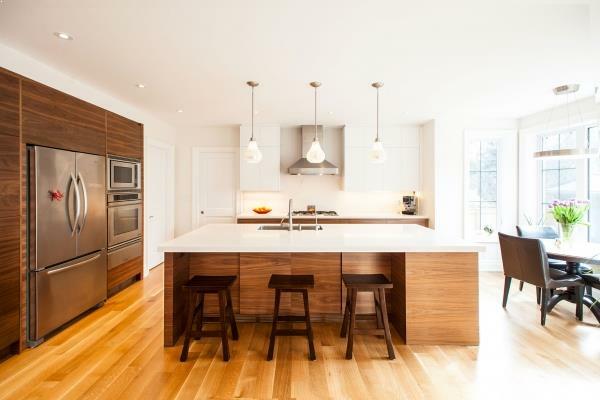 The home’s interiors are beautiful and simple, with white counters and walls, light wooden floors and accents, and deep windowsills, due to the house’s double-stud wall assembly.